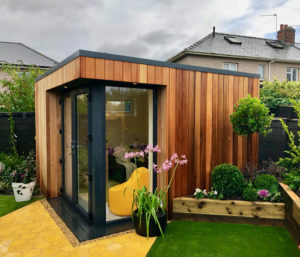 Vivid Green built a contemporary 3.36m x 3.36m garden room for Alan Titchmarsh’s Love Your Garden. You can by the same spec building for the special price of £16,999 inc VAT. Vivid Green created this family chillout room as part of a wider garden transformation. The family wanted to create a room with an inside-outside feel. Two sets of bi-fold doors have been used to create a corner of glazing that emphasises this connection. This 8m x 8m x 4m L-shaped garden room by Vivid Green is been designed to create an entertaining space for the family. The building also incorporates a large secret storage room. Vivid Green was one of the first firms we featured on The Garden Room Guide when we launched back in 2009. They have just launched a new website showcasing their contemporary designs. Often the best recommendation for a product is from people who have brought it, here are a selection of testimonials from customers who have brought garden rooms from Vivid Green. See the slideshow below for photos. “A very worthwhile installation despite the initial high outlay. It’s a very versatile room that can be used all year round thanks to excellent insulation and low-cost underfloor heating, and it keeps us all sane as our son does his drumming practice away from the main house! Vivid Green designs modern garden buildings with particular attention given to their environmental impact, and as such buildings are designed to maximise solar gain, have high levels of thermal insulation and minimise any waste. Vivid Green offer two standard designs The Penthouse and The Winterhouse but also offer a bespoke design service which allows the customer to tailor their garden building to their needs and tastes, for instance you may have a difficult site or want a building with more than one use such as a workshop with separate store area. The garden buildings offered by Vivid Green are built with SIP’s – structural insulated panels which is a very efficient form of building both thermally speaking and at the speed they can be put together – which is a saving in embodied energy, typically garden buildings are installed in less than eight days on site. On top of the SIP’s framework Vivid Green’s buildings are well specified with high quality windows and doors with triple point locks and glazed with performance double glazed units. There is a wide choice of external cladding such as cedar, larch or Douglas fir which are all fitted with quality stainless steel fittings. Vivid Green’s garden buildings are suitable for year round use and are fitted with thermostatically controlled under floor heating which they estimate costs less than 50p a day to run during the winter, this type of heating is ideal as it allows you to place furniture where you want rather than make allowances for wall mounted heaters. For more photos of Vivid Green garden buildings see our Flickr site.